Past events will be brought back to life in an exhibition at Kielder Water & Forest Park this Sunday (28 June). The exhibition, which takes place next to The Bike Place, opposite Kielder Castle, will display footage from a unique event that took place in the Park earlier this year, to highlight a little-known piece of Northumberland’s history. Stone Frigate, a Live Action Role Play (LARP) and form of immersive art, happened in Kielder Water & Forest Park over the weekend of 27 February to 1 March. A LARP, which is a creative form of interactive storytelling, has participants physically playing a character of their own creation and engaging with other characters to develop an unfolding story. Developed by Blaydon-based artist Matt Stokes, Stone Frigate (a term given to onshore Royal Navy bases) explored a period during World War 2 when a disused 1930s Ministry of Labour camp, sited at Lewisburn close to the River North Tyne, was taken over by the Royal Navy. Renamed HMS Standard, the camp helped service personnel suffering from a variety of psychiatric conditions, with the eventual aim of returning them to active service. Nearly 30 people took part in the event in February, some coming from as far afield as Scandinavia, where they ‘lived’ in their character for the duration of the event and took part in activities in a perfectly recreated World War 2 barrack hut constructed by Matt and installed at a remote location within Kielder Forest. He said: “Stone Frigate was an incredible journey and process to attempt to create a slice of time, which conjured the surroundings and atmosphere of HMS Standard and what it might have been like for both the staff and inmates who were once sent there. “During the weekend, the players continually remained in character. They wore WWII uniform, heeded their ranks (for the most part! 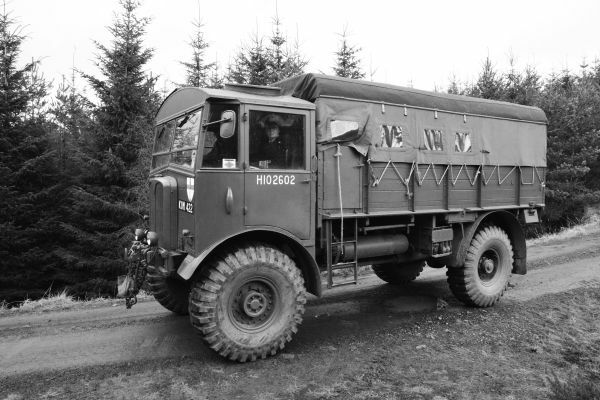 ), received therapy, ate wartime food, took rum rations, travelled in a period military personnel carrier between the accommodation barrack and mess created within Kielder Castle, and an activity barrack specially built in a remote area of the forest. This Sunday (28 June), from 11am until 4pm, Matt will be next to the Bike Place, Kielder, wearing World War 2 navy uniform, serving up tea and presenting footage and images from Stone Frigate. Stone Frigate was commissioned by Kielder Water & Forest Park Development Trust through its Art & Architecture programme, with support from Arts Council England and Northumberland County Council’s Community Chest scheme.